Firstly it's a bargain and secondly a triumph. 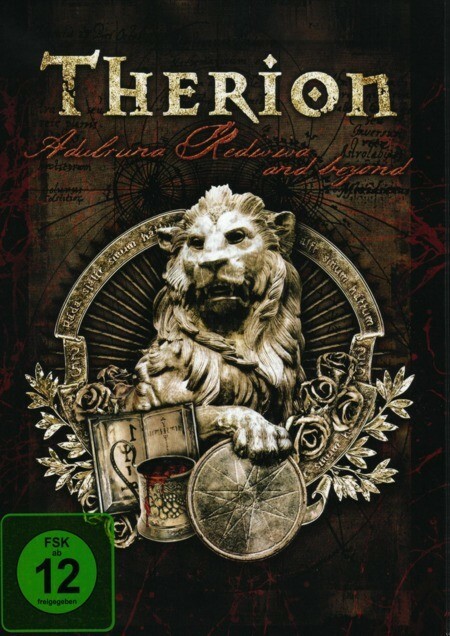 This three DVD set showcases Therion on two separate world tours. Their 20th Anniversary concert recorded in Budapest in 2007 and a newer show filmed at Prog Power Atlanta in 2011. The first disc is taken up with the Anniversary gig, which is an overblown show, where every little detail is taken to the upmost extremes and expanded out of all proportions. This is so that Therion could deliver a spectacular concert for their fanatical audience on this special night. Joining the main band to aid proceedings is a wonderful set of guest singers including Mats Leven, Snowy Shaw, Lori Lewis and special guest for the night Messiah Marcolin. Also lending a helping hand during the show is Axel Rudi Pell's keyboard player Ferdy Doernberg who does an amazing job throughout the concert. What a spectacle the whole show is, with living statues masked to look like the Devil and various demons littering the stage with the band playing in front of a Gothic Cathedral backdrop. They act out various horrific scenarios during many of the songs that they perform, all of which helps to enhance this wonderful spectacle. Then, because it's the Anniversary of the band, we get a full rendition of the ground-breaking (where Therion really started to evolve and change, as a musical entity) 'Theli' album in all its glory. As they play this part of the show, the band really seem to be drawing their energy from the crowd and enjoying themselves immensely as they powerfully run through the songs from this superb album. The first disc finishes with encores 'Adulruna Rediviva' and 'Black Funeral' and Therion prove with this one concert that they aren't just a Heavy Metal band but something much, much more. If that wasn't enough we have their triumphant two hour show filmed at Prog Power 2011. Even though it's performed on a smaller stage and in front of an even smaller rabid crowd, it is no less powerful a concert. The band rock through twenty-one songs, with only a few of them repeated from the first disc, so in essence you get two completely different shows, both of which are eminently watchable. I think Therion fans will explode with joy once they have watched the two concert DVD's but I also think that those amongst you who might be a little sceptical as to the merits of Therion's music, will really enjoy watching and acquainting yourselves with this band's brand of Symphonic Metal. Rounding things off we have a third disc that features the 011 video where the band act out a thirteen minute Gothic Horror story using the music of 'Adulruna Rediviva' as its musical foundation. There is also a very interesting, 011 five part 'Making Of' documentary, plus three more videos 'Amazing Voice', 'Kali Yuga III' and 'Sons Of The Staves Of Time' to finish everything off. At almost five hours in length the 'Adulruna Rediviva And Beyond' is essentially two things, firstly it's a bargain and secondly a triumph.